To most people, a running track probably looks like simply a surface with lines and numbers and triangles and dash marks painted on top. But true quality running track surface construction involves more than that. This blog is the first of three in which will discuss what it takes to build a quality running track. Today will discuss the preparation required to ensure quality running track construction. 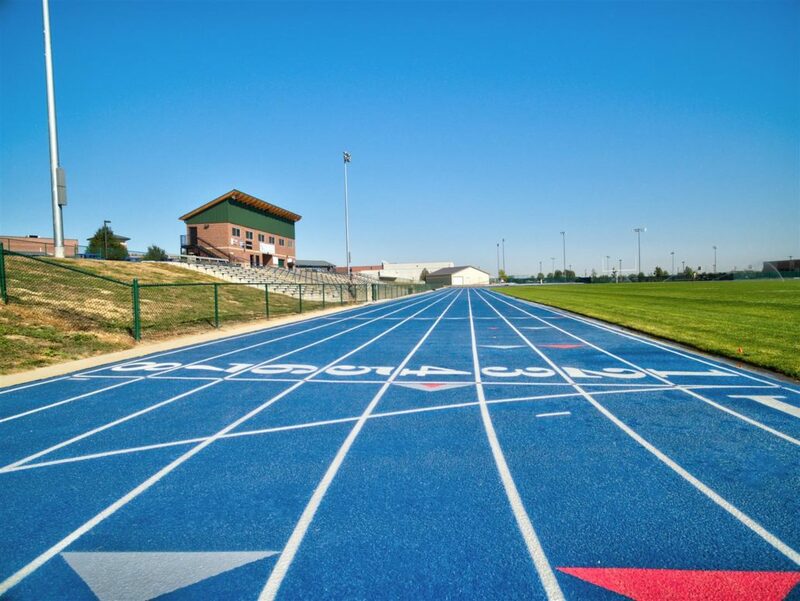 As with any construction project, running track surface installation takes the proper preparation in order to ensure the longevity of the track surface. With running tracks, preparation begins with inspecting the base, which is usually asphalt or concreate, for structural soundness. If the base is cracked or damaged, it will have to be replaced – or in extreme cases, repaired – before the running surface can be applied. Any cracks in the base will probably make their way to the running track surface, so it’s important to make sure the base is free of damage before applying a track surface. Poor water drainage at the track site could result in problems that range from cracks and heaves (caused by the freeze/thaw cycle) to erosion of the foundation as water pools and seeps under the running track base instead of being directed away from the track. Concerning planarity, to put it simply, track athletes need a level surface to run to perform well and stay injury-free. A level running track surface requires a level base. If the track base is sound, has good water drainage, and is level, before installing the running surface, it’s essential that the base is primed. Applying a primer – the right primer for your climate, whether hot, cold, humid or dry – will help ensure the longevity of your track. Without the right primer, your track will almost certainly experience cracking and other damage well before it would if the right primer were installed. What If My Track Base Has Problems? If your track base layer has problems, remediation will differ depending on the nature and extent of the issue. As mentioned above, there are some cases were the base is in too bad a condition to be repaired. In this situation, you’ll have to have a full-service running track construction company (we recommend Pro Track and Tennis, of course!) rip out the old, damaged base and install a new one. In less extreme cases, remediation of a damaged running track base could be done by cutting out the damaged section of the base and replacing just that section. If there are cracks in your running track’s base layer often the remedy is simply to fill the cracks. If your track was constructed without water-drainage in mind, and you’re seeing pooling on and around your track, you’ll likely have to consult a full-service running track construction company about drainage system options as improper water-drainage will almost certainly shorten the life of your running track. If your base layer has ruts, dips, or other blemishes that make it less-than-level, those imperfections can usually be filled and smoothed out so as to make the base suitable for applying the running surface. In part 2 of our series on “How to Install a Quality Running Track”, we’ll discuss the materials that make for a quality running track. In the meantime, if you have specific questions regarding your running track, feel free to email me at lance@protrackandtennis.com. I’d be glad to help you understand what it takes to build the best running track for your school or facility. Lance Laurent has been the track and tennis court resurfacing industry for over 20 years and has run Pro Track and Tennis, Inc. since 2005. Lance has extensive knowledge of the sports surfacing industry and has personally installed over 400 running track surfaces and just as many court surfaces. Pro Track and Tennis is a full service Running Track and Sport Court surfacing company.